Find and compare the best prices from a range of well known car rental companies at Warsaw Airport. This is a free to use facility, enabeling you to book direct with the company quoting the price. 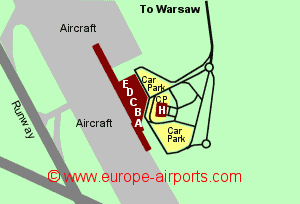 Warsaw Airport, otherwise known as Frederic Chopin Airport, is located 10Km South West of the historic city of Warsaw, central Poland, with the the Great Masurian Lakes to the north. Warsaw airport has what used to be described as 2 terminals, now one (named Terminal A), with check-in areas A,B,C, and D.
A suburban rail link between the airport and Warsaw was opened in 2012, giving a journey time of 25 minutes to the city centre. A bus service connects the airport to Warsaw and 30 other Polish towns while some of the hotels in the city use a shuttle minibus. Warsaw airport has 18 bars/cafes/restaurants, a bank, post office, 27 shops, a child care room, 4 ATMs, currency exchange, VIP lounge, executive lounge, conference centre. The Courtyard by Marriot hotel is situated with 100m of the terminal building. Passenger throughput totalled 15.7 million in 2017, an increase of 22% over the previous year, and the airport's busiest year yet.